Micro Analog Systems Oy introduces combined piezo and LED driver IC in a small QFN-16 3x3x0.75 mm package. It is a high efficiency, easy to use and low cost solution for piezo sound applications requiring highest sound pressure level (SPL). Typical applications include piezo buzzers, various alarm products, white goods and handheld or portable devices with sound feature. The MAS6251 includes LED driver which offers additional area and cost saving in many applications using LEDs. The heart of the IC is a high efficiency synchronous boost DC/DC converter requiring only a small 0806 sized 2.2mH inductor. The output voltage is regulated and adjustable up to 17.5V by external resistors. The bridge-tied load (BTL) output of the piezo driver is capable of driving up to 35Vpp signal in a very wide supply voltage range from 1.2V to 5.5V. The piezo driver is designed for three terminal self drive type piezoelectric transducers which produce very loud sound at resonance frequency of the piezo. 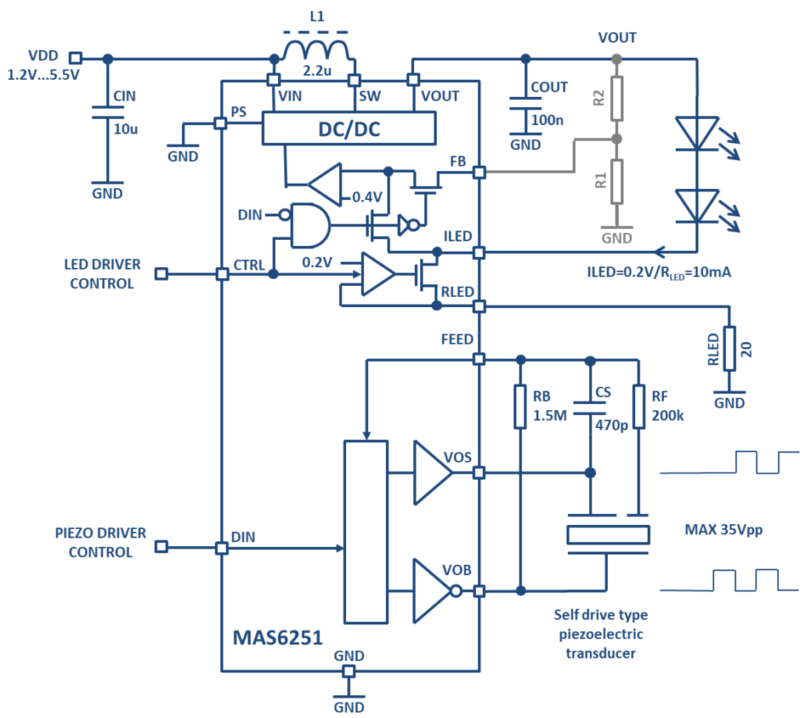 The LED driver supports use of pulse-width modulation (PWM) dimming control and is capable of driving up to 15mA current. The LED current is adjustable by external resistor. When not used the device enters shut down operating mode (typ 0.11mA) to save power. The MAS6251 is available in QFN-16 3x3x0.75 mm package. Samples are available. Price for a QFN packaged device is USD 0.98 (3 000 pcs). For further information and samples, please contact Micro Analog Systems Oy at info-mas@mas-oy.com.